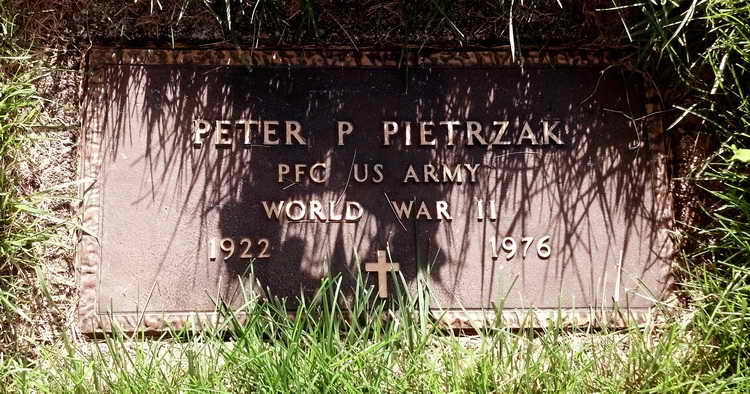 Grave marker for Peter P. Pietrzak in Section 18, Block: X, Lot 232 Space 4 of the Calvary Cemetery, Kettering (Montgomery county), Ohio. Peter enlisted in the Army at Ft Thomas, Newport, KY on 5 February 1942 and was assigned to Service Company, 508th. He remained with the company throughout WWII attaining the grade of Pfc on 4 January 1945.